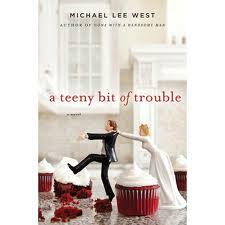 My Series Sunday pick is A Teeny Bit of Trouble, the second book in the Teeny Templeton series by Michael Lee West. It's not every day that a lady calls and accuses you of spying on her. Then when you actually do spy on her, you witness her murder. EEK! Then mix in your lawyer-boyfriend's secrets, a ten-year-old that may be his daughter, a flirtatious ex-boyfriend that keeps popping up bearing soul food and desserts, and trying to decode a stolen diary. It's a recipe for trouble. And our favorite freelance baker, Teeny Templeton, has found it. I just love Teeny. In just two books, she is a well-developed character that will draw any reader's interest. The first thing you notice is Teeny's humor. The first lines of A Teeny Bit of Trouble are an example. But it is the small character details about Teeny that are shown, not told, that make me love Michael Lee West's writing. Quirks like keeping a yearly tally of lies told, owning a colorful wardrobe where the only black outfit is a scuba suit, being too short, and using bad grammar are just a few of the qualities that make Teeny a memorable character. Best of all, she makes recipes that make me wipe drool from my NOOK screen. (Did you see the book cover with red velvet cupcakes?!) Some of the catchy titled recipes in this second installment include "The Right to Remain Silent Salsa" and "I've Already Hired an Attorney Chips." What I love most about this series are the not-so-easy-to-figure-out mysteries. Just when I think I have the mystery solved, the real culprit comes from left field. Michael Lee West keeps us guessing and hungrily turning the pages.